To make it easier to collect and store rain using larger tanks, we have created this range of Rainwater Harvesting Filter Systems. The Kits give you substantial savings over the components purchased individually. These Tank Kits are suitable for new and existing water storage tanks including Plastic (PE), Glass Reinforced Plastic (GRP) and concrete tanks (like for example Enduramaxx, Rototek, Wydale and Balmoral). The Tank Kits cover the first three steps of the professional rainwater cleaning system; filter, calm, overflow (the 4th step is the Floating Intake and included in our Water Pump Kits). They include an appropriate filter (sized according to the roof area), a calmed inlet and overflow siphon. They can be retro fitted into existing tanks, or purchased with new above and below ground rainwater tanks. Our Rainwater Harvesting Systems come with filters sized according to the maximum roof area you will be harvesting from. Uses the Patronenfilter to clean the rainwater. 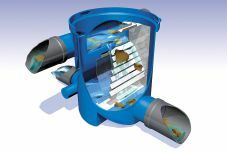 With just a height difference between the rainwater inlet and outlet of just 66mm this filter is perfect for maximising the storage capacity of your rainwater tank. Uses the VF1 Filter or VF1 Combi Filter. These filters have two filters within them and are ideal for mid-sized roofs and larger water storage tanks. 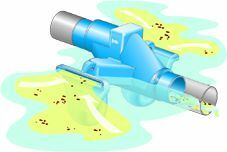 The primary filter gets rid of the largest dirt particles (leaves etc), the pre-filtered water then flows over a secondary filter sieve directly in to the sewer. This means these filters are self-cleaning and require very low maintenance. Select "450m2 with VF1 Filter" when installing the filter in a below ground tank. Select "450m2 with VF1 Filter and Filter Extension Tube" when installing the filter before the tank as a "pre-tank" filter below the ground. The telescopic extension has a locking lid and can be adjusted to a maximum height of 750mm (minimum 250mm). Select "450m2 with VF1 Combi Filter" when installing the filter in an above ground water tank. Uses the Twin Filter. The Twin filter can be installed in chambers underground however it is more commonly fitted directly against a frost-free wall. 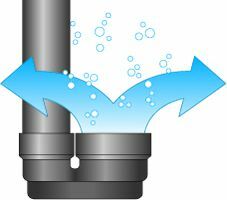 The 2 filters in the Filter mean that the unit can be installed against a non-vertical surface. Strong Wall Brackets are included in the Kit to attach the filter to a wall. If you would like to discuss your rainwater filter requirements, please contact us either by email or phone. We are more than happy to talk through your requirements. The same 3P Technik Calmed Inlet is included in each Kit. Please see our Rainwater Pump Kits for in-tank situations for the 4th Step. Click the button below to add the Rainwater Tank Filter System to your wish list.